Since the first large genome-wide association study (GWAS) of seven common diseases performed by the Wellcome Trust Case-Control Consortium (WTCCC, www.wtccc.org.uk ), a myriad of follow-up studies and independent GWASs on different diseases have fast-forwarded the genetics of common diseases. As a result, our increased understanding of the genetic background of common diseases is unprecedented, and ongoing exponentially. Currently the GWAS catalog holds 4892 independent reports of loci associated with different traits and in different populations with genome-wide association level. Since on average more than 450 GWAS papers are published each month, the number of associated loci will continue to increase. Here, we give a general overview of the past decade and describe the historic development of the techniques and statistical approaches of gene mapping in which GWAS takes a major place, and reflect on the future directions of genetic research. The human genome, or human Deoxyribonucleic Acid (DNA), consists of around 3.2 billion nucleotides chained together and organized into 23 different chromosome pairs. Four different nucleotides make up the sequence of this genome, and for a large part are identical between any two human individuals, but variation of nucleotide sequence exists. The most abundant variations are single nucleotide variations, i.e., single nucleotide polymorphisms (SNPs). The presence or absence of variable nucleotide sequence is called a genotype, and marks its specific position on the genome (marker). An SNP is in general a single nucleotide sequence variation at a given nucleotide in the genome. Determination of this variation in subjects is the process of genotyping. It is safe to say that the development of automated genotyping technologies is the single most important factor that has spawned the current GWAS. The genotyping of thousands of SNPs from more than thousand individuals lies at the heart of every GWAS. SNPs are the most abundant form of variation of the human genome and are truly spread "genome-wide" in sufficient density to allow complete coverage of the genome. Since the beginning of gene mapping through DNA markers, maps of the genome have been generated that show physical location of the polymorphic markers. Mapping of SNPs has been done within a large international consortium, HapMap. The HapMap consortium is a catalog of common genetic variants of the human genome, and describes the type and location of variation with its distribution among different populations. Importantly, this information has been used by the scientific community and sequencing companies to select the set of variations (SNPs) that most effectively capture all variations of the genome. During the development of the HapMap project, it became evident that the human genome was inherited in selective "chunks" defined by hotspots of recombination. These chunks, originally named haplotype blocks, represent groups of SNPs that seem not to be broken by recombination. , This unique feature of the variation in our genome allowed for selection of a minimal set of SNPs that effectively capture all variations in the haplotype blocks. , These minimal set of SNPs were called tagging SNPs (tSNPs) as they tag other unobserved variation. The success of GWASs also depends on the ability to automate SNP genotyping. A few disease-specific arrays are commercially available, such as the human cancer-, immune-, and metabo-beadchips. ,, These chips contain all relevant SNPs for cancer, immunological, or metabolic syndrome diseases, and allow cost-effective large-scale follow-up studies of previously detected disease associations. The general outline of the steps taken in a GWAS is presented in [Figure 2]. The first large GWAS was conducted by the WTCCC and consisted of simultaneous effort involving seven disease cohorts of ±2000 patients each and two central control groups of ±1500 individuals each. This first study virtually doubled the known genetic risk factors for most of the targeted diseases. For the autoimmune diseases, Type 1 Diabetes (T1D), Crohn's disease, and rheumatoid arthritis (RA), this first and the following GWASs have been particularly successful, and so far, more than 20 common genetic risk variants have been detected. These discoveries have led to an increase in our understanding of the disease mechanism. For example, for T1D, GWAS hits confirmed the importance of T-cell functionality for disease evident from significant associations of CTLA4, PTPN22, IL2, and IL2RA, and the central role of the HLA class II antigen presentation mechanism of the adaptive immune system. Not surprisingly, these immune-related associations are largely shared with other autoimmune diseases, yet notable exceptions are still not clarified "telltales" of disease-specific different mechanisms within autoimmune diseases. However, unexpected associations were also detected. For example, association was also detected between SH2B3 on chromosome 12q24 and T1D. Surprisingly, this association is not only shared with other autoimmune diseases such as celiac disease (CeD), systemic lupus erythematous, RA, and multiple sclerosis (MS), but also with platelet count and cardiovascular disease, hypertension, myeloproliferative diseases, erythrocytosis, suggesting a shared disease mechanism between these diseases mediated through SH2B3. ,,,,,,,, SH2B3 encodes for LNK, a member of the SH2B family of adaptor proteins that is a key molecule for several signaling pathways mediated by Janus kinase and receptor tyrosine kinases. The most relevant function of LNK is its regulatory function in hematopoeitic and non-hematopo eitic cells such as endothelial cells (EC) and its key inhibitory role is growth factor and cytokine receptor-mediated signaling, yet it may also serve as a protective factor against bacterial infection. , These findings suggest that LNK could be a useful target for modulation therapies. Another example of how GWAS has confirmed or in part elucidated the underlying disease mechanism is MS.  A recent MS consortium GWAS of close to 10,000 cases identified and confirmed more than 57 susceptibility loci, 21 of which are overlapping with CeD, Crohn's disease, T1D, or RA. For more common diseases, such as CHD, Type 2 Diabetes (T2D), and other traits such as height and body mass index (BMI), GWASs have expanded in size to more than 10,000 cases and controls. For CHD, the first major advance came in 2007 with the WTCCC and three independent studies reporting a strong association between common variants on chromosome 9p211. ,, Furthermore, this locus has subsequently been found to be associated to T2D, and aneurysms, but is not associated with cardiovascular risk factors such as lipids, blood pressure, or obesity. ,,, These observations are suggestive that the biological consequence of the risk variation at 9p21 affects an unexpected disease mechanism for CHD. From the examples given above, it is clear that GWASs have an enormous impact on our genetic understanding of common diseases. Finally, significant efforts are only recently underway to translate the genetic finding to disease-related function and possible application in clinical practice. Sander W. van der Laan is funded through a grant from CVON (GENIUS), the Netherlands. Folkert W. Asselbergs is supported by a clinical fellowship from the Netherlands Organisation for Health Research and Development (ZonMw grant 90700342). 1. Wellcome Trust Case Control Consortium. Genome-wide association study of 14,000 cases of seven common diseases and 3,000 shared controls. Nature 2007;447:661-78. 2. Hindorff LA, MacArthur J, Morales J, Junkins HA, Hall PN, Klemm AK, et al. A Catalog of Published Genome-Wide Association Studies. Available from: http://www.genome.gov/gwastudies [Last accessed on 2012 Dec 15]. 3. CARDIoGRAMplusC4D Consortium; Deloukas P, Kanoni S, Willenborg C, Farrall M, Assimes TL, et al. Large-scale association analysis identifies new risk loci for coronary artery disease. Nat Genet 2013;45:25-33. 4. International Consortium for Blood Pressure Genome-Wide Association Studies, Ehret GB, Munroe PB, Rice KM, Bochud M, Johnson AD, et al. Genetic variants in novel pathways influence blood pressure and cardiovascular disease risk. Nature 2011;478:103-9. 5. Asselbergs FW, Guo Y, van Iperen EP, Sivapalaratnam S, Tragante V, Lanktree MB, et al. Large-scale gene-centric meta-analysis across 32 studies identifies multiple lipid loci. Am J Hum Genet 2012;91:823-38. 6. ENCODE Project Consortium, Dunham I, Kundaje A, Aldred SF, Collins PJ, Davis CA, et al. The ENCODE Project Consortium. An integrated encyclopedia of DNA elements in the human genome. Nature 2012;489:57-74. 7. Maurano MT, Humbert R, Rynes E, Thurman RE, Haugen E, Wang H, et al. Systematic localization of common disease associated variation in regulatory DNA. Science 2012;337:1190-5. 8. Krueger JG, Fretzin S, Suárez-Fariñas M, Haslett PA, Phipps KM, Cameron GS, et al. IL-17A is essential for cell activation and inflammatory gene circuits in subjects with psoriasis. J Allergy Clin Immunol 2012;130:145-54. 9. Leonardi C, Matheson R, Zachariae C, Cameron G, Li L, Edson-Heredia E, et al. Anti-interleukin-17 monoclonal antibody ixekizumab in chronic plaque psoriasis. N Engl J Med 2012;366:1190-9. 10. Tsoi LC, Spain SL, Knight J, Ellinghaus E, Stuart PE, Capon F, et al. Identification of 15 new psoriasis susceptibility loci highlights the role of innate immunity. Nat Genet 2012;44:1341-8. 11. Weeks DE, Lathrop GM. Polygenic disease: methods for mapping complex disease traits. Trends Genet 1995;11:513-9. 12. Rich SS, Concannon P. Challenges and strategies for investigating the genetic complexity of common human diseases. Diabetes 2002;51(Suppl 3):S288-94. 13. Freimer N, Sabatti C. The use of pedigree, sib-pair and association studies of common diseases for genetic mapping and epidemiology. Nat Genet 2004;36:1045-51. 14. Fan JB, Chee MS, Gunderson KL. Highly parallel genomic assays. Nat Rev Genet 2006;7:632-44. 15. The International HapMap Consortium. The International HapMap Project. Nature 2003;426:789-96. 16. Reich DE, Cargill M, Bolk S, Ireland J, Sabeti PC, Richter DJ, et al. Linkage disequilibrium in the human genome. Nature 2001;411:199-204. 17. Wall JD, Pritchard JK. Haplotype blocks and linkage disequilibrium in the human genome. Nat Rev Genet 2003;4:587-97. 18. de Bakker PI, Yelensky R, Pe′er I, Gabriel SB, Daly MJ, Altshuler D. Efficiency and power in genetic association studies. Nat Genet 2005;37:1217-23. 19. Tian C, Gregersen PK, Seldin MF. Accounting for ancestry: population substructure and genome-wide association studies. Hum Mol Genet 2008;15:R143-50. 20. Price AL, Patterson NJ, Plenge RM, Weinblatt ME, Shadick NA, Reich D. Principal components analysis corrects for stratification in genome-wide association studies. Nature Genet 2006;38:904-9. 21. Zheng G, Freidlin B, Gastwirth JL. Robust genomic control for association studies. Am J Hum Genet 2006;78:350-6. 22. Voight BF, Kang HM, Ding J, Palmer CD, Sidore C, Chines PS, et al. 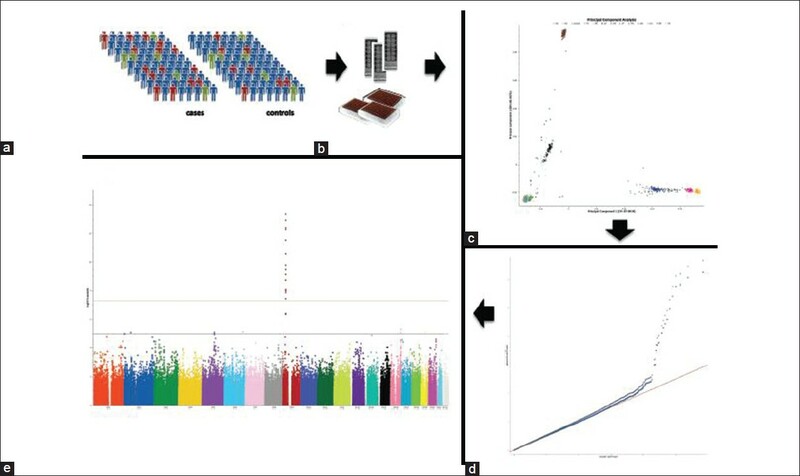 The metabochip, a custom genotyping array for genetic studies of metabolic, cardiovascular, and anthropometric traits. PLoS Genet 2012;8:e1002793. 23. Polychronakos C. Fine points in mapping autoimmunity. Nat Genet 2011;43:1173-4. 24. Packer BR, Yeager M, Burdett L, Welch R, Beerman M, Qi L, et al. SNP500Cancer: A public resource for sequence validation, assay development, and frequency analysis for genetic variation in candidate genes. Nucleic Acids Res 2006;34:D617-21. 25. Risch NJ. Searching for genetic determinants in the new millennium. Nature 2000;405:847-56. 26. Wang WY, Barratt BJ, Clayton DG, Todd JA. Genome-wide association studies: theoretical and practical concerns. Nat Rev Genet 2005;6:109-18. 27. Hirschhorn JN, Daly MJ. Genome-wide association studies for common diseases and complex traits. Nat Rev Genet 2005;6:95-108. 28. Pritchard JK. Are rare variants responsible for susceptibility to complex diseases? Am J Hum Genet 2001;69:124-37. 29. Reich DE, Lander ES. On the allelic spectrum of human disease. Trends Genet 2001;17:502-10. 30. Bodmer W, Bonilla C. Common and rare variants in Multifactorial susceptibility to common diseases. Nat Genet 2008;40:695-701. 31. McCarthy MI, Abecasis GR, Cardon LR, Goldstein DB, Little J, Ioannidis JP, et al. Genome-wide association studies for complex traits: consensus, uncertainty and challenges. Nat Rev Genet 2008;9:356-69. 32. Wang WY, Pike N. The allelic spectra of common diseases may resemble the allelic spectrum of the full genome. Med Hypotheses 2004;63:748-51. 33. Manolio TA, Collins FS, Cox NJ, Goldstein DB, Hindorff LA, Hunter DJ, et al. Finding the missing heritability of complex diseases. Nature 2009;461:747-53. 34. Cirulli ET, Goldstein DB. 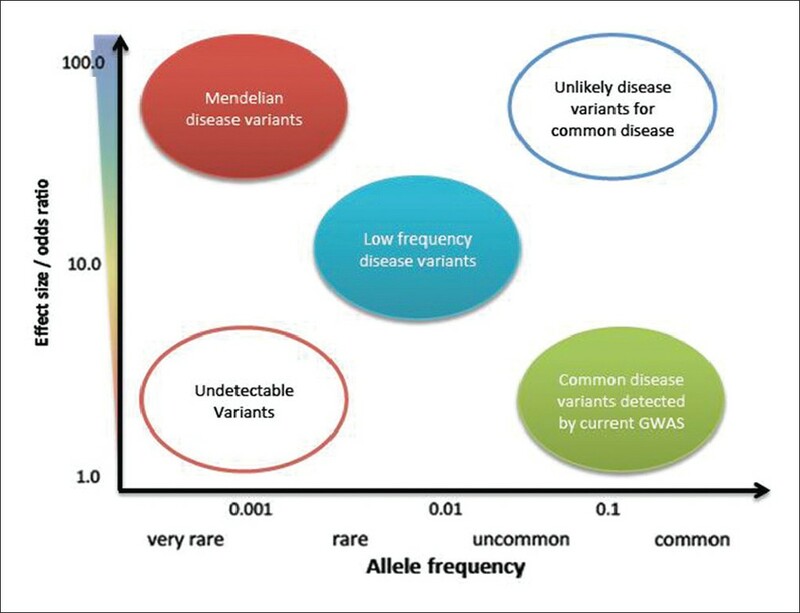 Uncovering the roles of rare variants in common disease through whole-genome sequencing. Nat Rev Genet 2010;11:415-25. 35. Eichler EE, Flint J, Gibson G, Kong A, Leal SM, Moore JH, et al. Missing heritability and strategies for finding the underlying causes of complex disease. Nat Rev Genet 2010;11:446-50. 36. Barrett JC, Clayton DG, Concannon P, Akolkar B, Cooper JD, Erlich HA, et al. Type 1 Diabetes Genetics Consortium. Genome-wide association study and meta-analysis find that over 40 loci affect risk of type 1 diabetes. Nat Genet 2009;41:703-7. 37. Cotsapas C, Voight BF, Rossin E, Lage K, Neale BM, Wallace C, et al. FOCiS Network of Consortia. Pervasive sharing of genetic effects in autoimmune disease. PLoS Genet 2011;7:e1002254. 38. Todd JA, Walker NM, Cooper JD, Smyth DJ, Downes K, Plagnol V, et al. Robust associations of four new chromosome regions from genome-wide analyses of type 1 diabetes. Nat Genet 2007;39:857-64. 39. Romanos J, Barisani D, Trynka G, Zhernakova A, Bardella MT, Wijmenga C. Six new coeliac disease loci replicated in an Italian population confirm association with coeliac disease. J Med Genet 2009;46:60-3. 40. Hunt KA, Zhernakova A, Turner G, Heap GA, Franke L, Bruinenberg M, et al. Newly identified genetic risk variants for celiac disease related to the immune response. Nat Genet 2008;40:395-402. 41. Gateva V, Sandling JK, Hom G, Taylor KE, Chung SA, Sun X, et al. A large scale replication study identifies TNIP1, PRDM1, JAZF1, UHRF1BP1 and IL10 as risk loci for systemic lupus erythematosus. Nat Genet 2009;41:1228-33. 42. Coenen MJ, Trynka G, Heskamp S, Franke B, van Diemen CC, Smolonska J, et al. Common and different genetic background for rheumatoid arthritis and coeliac disease. Hum Mol Genet 2009;18:4195-203. 43. Alcina A, Vandenbroeck K, Otaegui D, Saiz A, Gonzalez JR, Fernandez O, et al. The autoimmune disease-associated KIF5A, CD226 and SH2B3 gene variants confer susceptibility for multiple sclerosis. Genes Immun 2010;11:439-45. 44. Levy D, Ehret GB, Rice K, Verwoert GC, Launer LJ, Dehghan A, et al. Genomewide association study of blood pressure and hypertension. Nat Genet 2009;41:677-87. 45. Oh ST, Simonds EF, Jones C, Hale MB, Goltsev Y, Gibbs Jr KD, et al. Novel mutations in the inhibitory adaptor protein LNK drive JAK-STAT signaling in patients with myeloproliferative neoplasms. Blood 2010;116:988-92. 46. Lasho TL, Pardanani A, Tefferi A. LNK mutations in JAK2 mutation-negative erythrocytosis. N Engl J Med 2010;363:1189-90. 47. Soranzo N, Spector TD, Mangino M, Kühnel B, Rendon A, Teumer A et al. A genome-wide meta-analysis identifies 22 loci associated with eight hematological parameters in the HaemGen consortium. Nat Genet 2009;41:1182-90. 48. Zhernakova A, Elbers CC, Ferwerda B, Romanos J, Trynka G, Dubois PC, et al. Evolutionary and functional analysis of celiac risk loci reveals SH2B3 as a protective factor against bacterial infection. Am J Hum Genet 2010;86:970-7. 49. Devallière J, Charreau B. The adaptor Lnk (SH2B3): An emerging regulator in vascular cells and a link between immune and inflammatory signaling. Biochem Pharmacol 2011;82:1391-402. 50. Compston A, Coles A. Multiple sclerosis. Lancet 2008;372:1502-17. 51. International Multiple Sclerosis Genetics Consortium; Wellcome Trust Case Control Consortium 2, Sawcer S, Hellenthal G, Pirinen M, Spencer CC, Patsopoulos NA, et al. Genetic risk and a primary role for cell-mediated immune mechanisms in multiple sclerosis. Nature 2011;476:214-9. 52. Samani NJ, Erdmann J, Hall AS, Hengstenberg C, Mangino M, Mayer B, et al. Genomewide association analysis of coronary artery disease. N Engl J Med 2007;357:443-53. 53. McPherson R, Pertsemlidis A, Kavaslar N, Stewart A, Roberts R, Cox DR, et al. A common allele on chromosome 9 associated with coronary heart disease. Science 2007;316:1488-91. 54. Helgadottir A, Thorleifsson G, Manolescu A, Gretarsdottir S, Blondal T, Jonasdottir A, et al. A common variant on chromosome 9p21 affects the risk of myocardial infarction. Science 2007;316:1491-3. 55. Shea J, Agarwala V, Philippakis AA, Maguire J, Banks E, Depristo M, et al. Comparing strategies to fine-map the association of common SNPs at chromosome 9p21 with type 2 diabetes and myocardial infarction. Nat Genet 2011;43:801-5. 56. Helgadottir A, Thorleifsson G, Magnusson KP, Grétarsdottir S, Steinthorsdottir V, Manolescu A, et al. The same sequence variant on 9p21 associates with myocardial infarction, abdominal aortic aneurysm and intracranial aneurysm. Nat Genet 2008;40:217-24. 57. Samani NJ, Raitakari OT, Sipilä K, Tobin MD, Schunkert H, Juonala M, et al. Coronary artery disease-associated locus on chromosome 9p21 and early markers of atherosclerosis. Arterioscler Thromb Vasc Biol 2008;28:1679-83. 58. Angelakopoulou A, Shah T, Sofat R, Shah S, Berry DJ, Cooper J, et al. Comparative analysis of genomewide-association studies signals for lipids, diabetes, and coronary heart disease: Cardiovascular Biomarker Genetics Collaboration. Eur Heart J 2012;33:393-407. 59. Visel A, Zhu Y, May D, Afzal V, Gong E, Attanasio C, et al. Targeted deletion of the 9p21 non-coding coronary artery disease risk interval in mice. Nature 2010;464:409-12. 60. Cunnington MS, Santibanez Koref M, Mayosi BM, Burn J, Keavney B. Chromosome 9p21SNPs associated with multiple disease phenotypes correlate with ANRIL expression. PLoS Genet 2010;6:e1000899. 61. Zhuang J, Peng W, Li H, Wang W, Wei Y, Li W, et al. Methylation of p15INK4b and expression of ANRIL on chromosome 9p21 are associated with coronary artery disease. PLoS One 2012;7:e47193. 62. Schunkert H, König IR, Kathiresan S, Reilly MP, Assimes TL, Holm H, et al. Large-scale association analysis identifies 13 new susceptibility loci for coronary artery disease. Nat Genet 2011;43:333-8. 63. Coronary Artery Disease (CAD) Genetics Consortium. A genome-wide association study in Europeans and South Asians identifies five new loci for coronary artery disease. Nat Genet 2011;43:339-44. 64. Huyghe JR, Jackson AU, Fogarty MP, Buchkovich ML, Stančáková A, Stringham HM, et al. Exome array analysis identifies new loci and low-frequency variants influencing insulin processing and secretion. Nat Genet 2013;45:197-201. 65. The 1000 Genomes Project Consortium. An integrated map of genetic variation from 1,092 human genomes. Nature 2012;491:56-65. 66. Ng SB, Turner EH, Robertson PD, Flygare SD, Bigham AW, Lee C, et al. Targeted capture and massively parallel sequencing of 12 human exomes. Nature 2009;461:272-6. 67. Yu TW, Chahrour MH, Coulter ME, Jiralerspong S, Okamura-Ikeda K, Ataman B, et al. Using Whole-Exome Sequencing to Identify Inherited Causes of Autism. Neuron 2013;77:259-73. 68. Neale BM, Kou Y, Liu L, Ma′ayan A, Samocha KE, Sabo A, et al. Patterns and rates of exonic de novo mutations in autism spectrum disorders. Nature 2012;485:242-5. 69. O′Roak BJ, Vives L, Girirajan S, Karakoc E, Krumm N, Coe BP, et al. Sporadic autism exomes reveal a highly interconnected protein network of de novo mutations. Nature 2012;485:246-50. 70. Sanders SJ, Murtha MT, Gupta AR, Murdoch JD, Raubeson MJ, Willsey AJ, et al. De novo mutations revealed by whole-exome sequencing are strongly associated with autism. Nature 2012;485:237-41. 71. Trynka G, Sandor C, Han B, Xu H, Stranger BE, Liu XS, et al. Chromatin marks identify critical cell types for fine mapping complex trait variants. Nat Genet 2013;45:124-30. 72. Simpfendorfer KR, Olsson LM, Manjarrez Orduño N, Khalili H, Simeone AM, Katz MS, et al. The autoimmunity-associated BLK haplotype exhibits cis-regulatory effects on mRNA and protein expression that are prominently observed in B cells early in development. Hum Mol Genet 2012;21:3918-25. 73. Gregersen PK, Diamond B, Plenge RM. GWAS implicates a role for quantitative immune traits and threshold effects in risk for human autoimmune disorders. Curr Opin Immunol 2012;24:538-43.